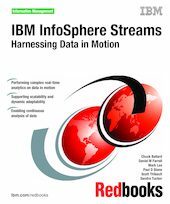 In this IBM® Redbooks® publication, we discuss and describe the positioning, functions, capabilities, and advanced programming techniques for IBM InfoSphere™ Streams (V1). See: http://www.redbooks.ibm.com/abstracts/sg247970.html for the newer InfoSphere Streams (V2) release. Stream computing is a new paradigm. In traditional processing, queries are typically run against relatively static sources of data to provide a query result set for analysis. With stream computing, a process that can be thought of as a continuous query, that is, the results are continuously updated as the data sources are refreshed. So, traditional queries seek and access static data, but with stream computing, a continuous stream of data flows to the application and is continuously evaluated by static queries. However, with IBM InfoSphere Streams, those queries can be modified over time as requirements change. IBM InfoSphere Streams takes a fundamentally different approach to continuous processing and differentiates itself with its distributed runtime platform, programming model, and tools for developing continuous processing applications. The data streams consumable by IBM InfoSphere Streams can originate from sensors, cameras, news feeds, stock tickers, and a variety of other sources, including traditional databases. It provides an execution platform and services for applications that ingest, filter, analyze, and correlate potentially massive volumes of continuous data streams.